Hotel-Fink is located in the Rotherbaum district of Hamburg and offers free Wi-Fi access. The nearest U-Bahn station is only 300 metres away and there is a bus stop directly in front of the building. The classic-style room come with a cable TV. Some of the rooms have a balcony. At Hotel-Fink you will find a garden and a shared kitchen. A hearty breakfast buffet is served every morning. 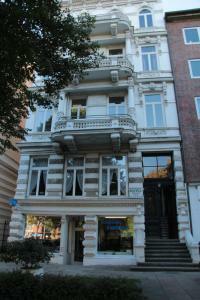 The hotel less than 3 km from the Reeperbahn, Hamburg Central Station and Theatre Neue Flora. Hamburg Airport is 7 km away and Hamburg University is a 10-minute walk from the hotel. The property offers parking at an extra cost.